As suggested below, I tried using unity-tweak-tool, but could not locate the Mouse Edge Stickiness option. Any guidance is appreciated. Once again, Thank you, as this will help my carpal tunnel syndrome! Thank you! Go to Displays and disable Sticky edges. Did you install Unity with the CompizConfig Settings Manager? You can download it with sudo apt-get install compizconfig-settings-manager. Then launch with ccsm. Click the desktop section on the left then Unity plugin, use the filter to find "Edge Stop Velocity" and set it to 0. I fixed it in 14.04 with compizconfig-settings-manager as Kellen Donohue mentioned. By setting "Edge Stop Velocity" to 1 (0 isn't accepted) and "Duration of Sticky Edge Relase after Break" to 0. I needed to logout/login again. For those that googled this answer looking for how to disable Window sticky edges. Type ccsm (to install sudo apt-get install compizconfig-settings-manager) and filter by edge. Go to Snapping Windows > Behavior > Snap Type and uncheck Edge resistance and Edge attraction. It's because of the menu. ntrrgc is right, but you have to put the launcher bar all to the right, not in each display. 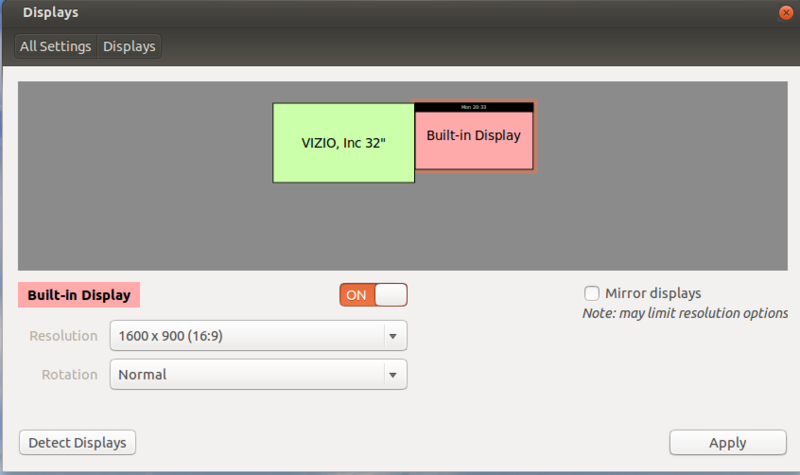 That fixes the stick problem and is worse, when you have that menu in both displays and with the option hide menu bar. The best answer is here: How do I disable mouse magnet on middle edge with multi monitors? You need to change "Launcher Placement". Change "All Displays" and only select your left-most display. MAGIC! I tried others' CompizConfig settings for edge stop velocity, overcome pressure, duration of sticky edge release, etc. to no avail. I ended up unchecking "Launcher Capture Mouse" in the same settings screen and it's working as I hoped it would: no stick whatsoever. 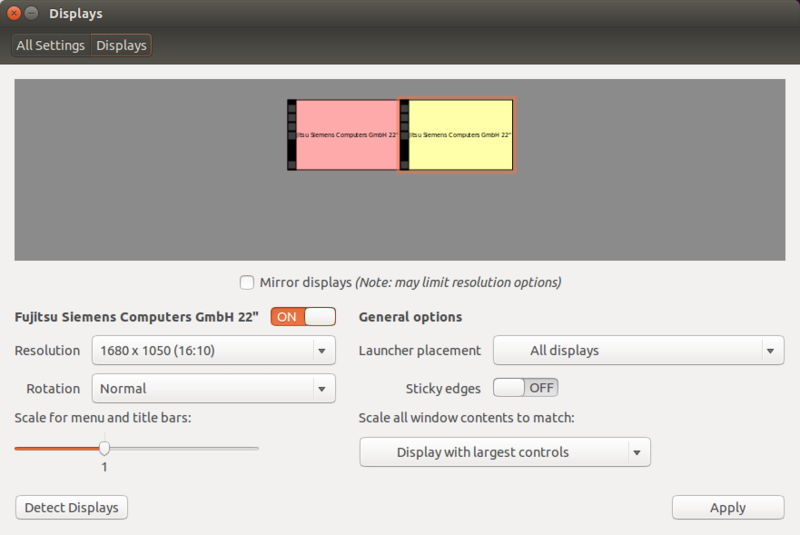 One solution is to set the external monitor onto the left side of the desktop monitor in System-Settings >> Displays. This changes the direction you slide your mouse into the next screen, but this works when the "Sticky Edge" and CompizConfig-System-Manager options do not. It appears that the issue with the right side is the placement of the workspace navigator along the right edge of the main monitor. The workaround is to find the sweet spots above and below the navigator but that can be rather annoying to rely upon. NOTE: Applying this change to the left side of the monitor relinquishes any left-screen edge mouse controls such as the system search bar and the applications sidebar. However you still can access it via the "Super" button. But if you're using Gnome-Do or if you're a terminal wiz, this shouldn't be much of an issue..
Not the answer you're looking for? Browse other questions tagged 13.10 14.04 multiple-monitors mouse . How do I properly configure my screen edges to be non-sticky? Disabling Sticky Edges on Ubuntu 14.04? Where is the sticky edges option (for multiple screens)?